An oped for the New York Times, September 2018. A couple of years ago, my parents moved into Brooksby Village — one of Boston’s largest retirement communities. The residents like to joke that it’s a cruise ship that never docks. There are restaurants, recreation rooms, variously denominated chapels. And there are corridors, many of them, all seemingly identical. You can easily get lost, particularly if your cognitive faculties aren’t what they once were. I expect it’s partly for this reason that the management at Brooksby installed a shelf outside each apartment door. The shelves are small, about two feet long and one foot deep, and all are exactly the same. Yet the residents use them in endlessly varied ways. My parents choose to display a blue glass vase (a gift from me) and, somewhat incongruously, a little bronze Komodo dragon. Some shelves feature sentimental cards or teddy bears or flowers, real and artificial, or mementos of loved ones. Others bespeak the eclectic ethnic mix of the community, and are filled with Irish and Italian and Polish and Russian tchotchkes and flags. On others still are crafts, paintings, sculptures, some souvenirs from past travels, some made by the residents themselves. The shelf outside Jackie Amadeo’s apartment at Brooksby Village. Photo Adam Glanzman for The New York Times. The result is that, as you walk around Brooksby Village, you always know where you are, thanks to the familiar landmarks. But it’s obvious that the shelves and their contents are serving a purpose higher than mere navigation. Despite the diversity, they have a single message. They are a way to say to passers-by: This is us. There is deep feeling here if you are open to seeing it. Many attachments may have fallen by the wayside. Friends may have died, homes sold, children grown up and moved away. But the macaroni-encrusted chicken is still there, and with it, a measure of self-identity. As a professional curator, I feel there is something to learn from these micro-exhibitions. After all, they are a lot more emotive than many museum and gallery shows manage to be. Once I began thinking about them, I started noticing other similar displays, in other places, marking other times of life. Objects laid by a child’s crib, on a dorm room desk, along an office cubicle ledge, at the foot of a gravestone. Wherever we are, at whatever age, we have an impulse to tell people who we really are through a few resonant objects. Having dedicated my career to the history and creativity of craft, I have become increasingly worried about the incursion of the digital into our lives. There is much gratification and practical use to be had through the sliding, tapping and clicking that we all do incessantly, bathed in the encouraging glow of our screens. But aren’t we losing something in the process? This goes far beyond the ability to make things, or even to understand how they are made. It has to do with a pervasive disconnect from our physical surroundings, in all their richness. It has to do with the way we are losing touch, quite literally, with the accumulated “material intelligence” of the past. All useful objects, from satellites to screwdrivers, are a repository of this material intelligence that has been handed down from previous generations. When we underestimate that inheritance (perhaps because we overstate the worth of newer technologies) we risk cutting ourselves off not only from the human past, but from those people around us who still have a hand in making our world what it is. Will Brooksby Village eventually replace its shelves with digital tablets that automatically scroll through thousands of family pictures, but communicate far less than a few carefully-chosen things? I doubt it. As humans, the urge to keep objects close is deeply rooted in us. Today, it’s easy to lose track of this desire, either getting distracted by our devices, or surrounding ourselves with so many things that each one ceases to hold much value. At Brooksby, though, I’ve found reason for optimism. We will never lose touch completely with the curators inside us. 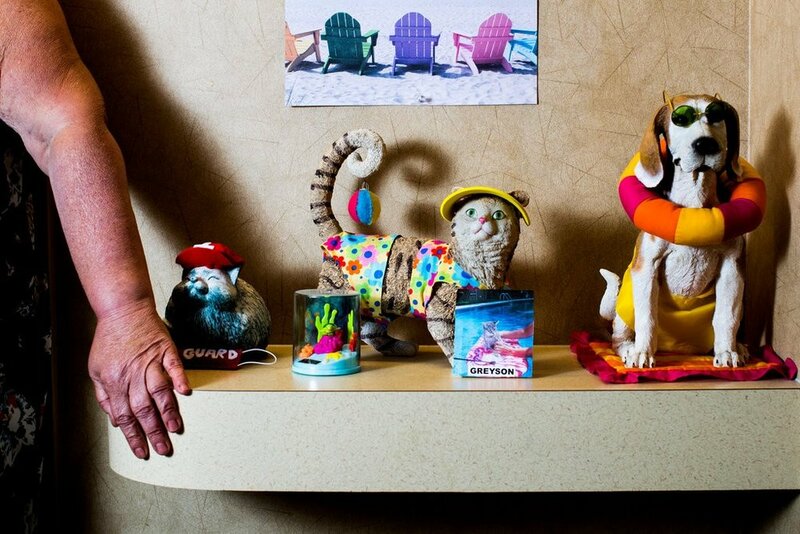 Personal objects from the shelves of Brooksby Village residents. Photo Adam Glanzman for the New York Times.